By an interesting coincidence, two items about the Dominican order popped up on facebook today. The bad-news item comes from Sandro Magister, who reports that for lack of vocations, the central Italian province of the Dominicans is apparently on the verge of closing one of its most important houses, San Marco in Florence. This follows the decision last year by the southern Italian province to close the equally important Neapolitan house at San Domenico Maggiore, once the home of St Thomas Aquinas. The church of the Order’s first Florentine house, Santa Maria Novella, was given to them in 1221, the same year that St Dominic died, and rebuilt, along with the large convent next to it, from the mid-13th to mid-14th centuries. By the middle of the 15th century, when much of Italy was still slowly recovering from the Black Death, Florence, (which had missed the worst of the plague,) was flourishing to such a degree, and the Order along with it, that a second Dominican house was needed. (Few Italian cities have two major houses of the same religious order.) A Benedictine monastery only a kilometer from Santa Maria Novella was suppressed and given to them in 1443, to be populated by men from the convent in nearby Fiesole; among them was the painter Blessed Fra Angelico. Cosimo de’ Medici then undertook a massive renovation of the complex; among the famous cells painted by Angelico and his students is a slightly larger one where Cosimo would go on retreat. 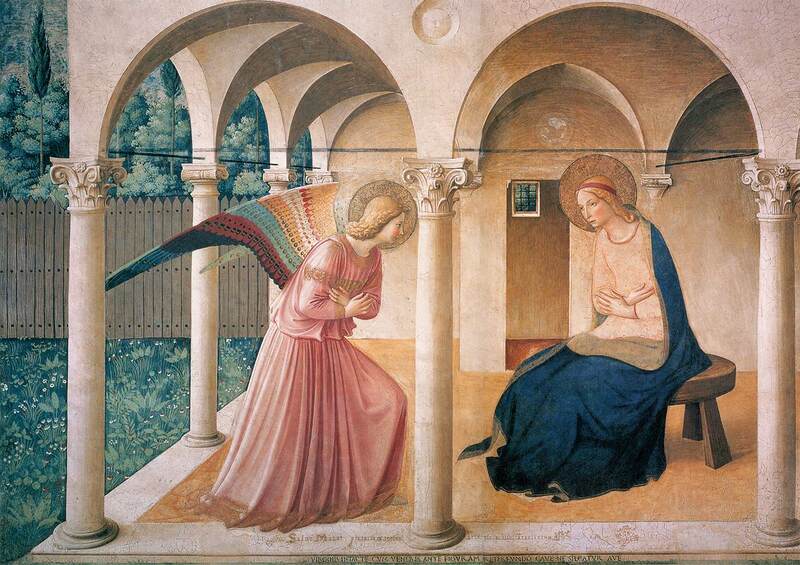 The Annunciation, by Fra Angelico, 1443. This painting is seen at the top of the stairs as one enter the area of the friars’ cells from the Museum. It has to be said that the church of San Marco as we have it today is unimpressive, the result of Florence’s over-enthusiastic embrace of the Counter-Reformation. It houses the relics of one of the greatest Saints of both Florence and the Dominican Order, Antoninus, also a founder of the house, and later archbishop; Cosimo de’ Medici used to say that the safety of Florence depended entirely on his prayers. The conventual buildings next door to the church, which have been property of the Italian state since 1866, now house the National Museum of San Marco, which includes among other things several more paintings by Fra Angelico, and a magnificent Last Supper by Domenico Ghirlandaio, the teacher of Michelangelo. The good-news item comes from First Things, which has a brief piece by Dominic Bouck, a member of the Province of St Joseph in the eastern United States, noting the surge in vocations in the Order in America. “After the ordination of eight of our brothers, there are over fifty of us studying for the priesthood or preparing to live life as a consecrated brother, about to be joined by fifteen more on July 25.” Not so long ago, the New York Times ran a piece to similar effect about the Dominicans in Ireland. Perhaps we can hope that in the not-too-distant future, the American and Irish superiors of the Dominicans will be able to spare some men to keep open some of the Order’s great historical houses on the continent.